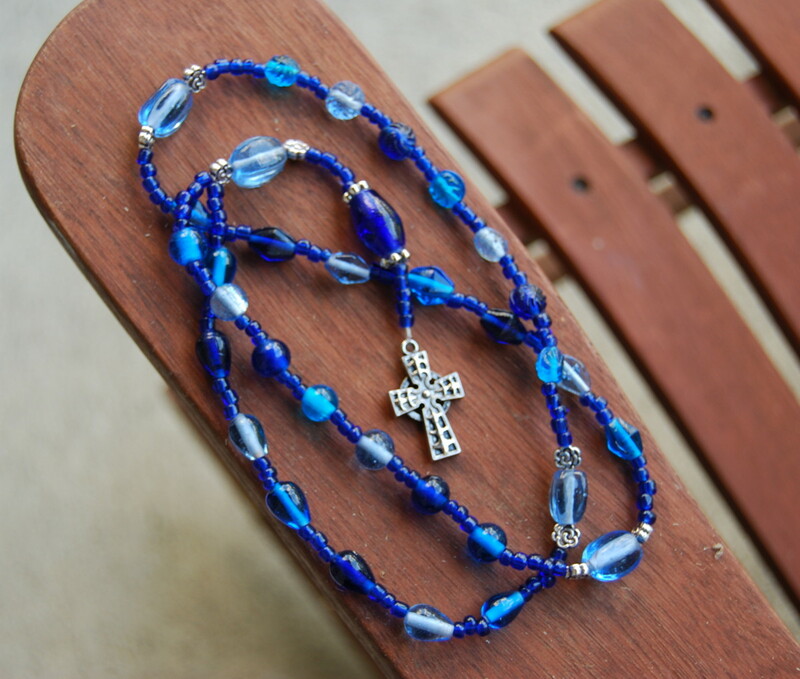 Do any of you listen to music when you meditate or pray – with or without prayer beads? I usually require silence, but at the last Book Expo, I came across Allegro Media Group‘s booth, where some very nice people from NewSound Music were offering CDs of world music that has a spiritual bent. Once I explained the purpose of my blog, account manager Paxton Scott very nicely gave me a stack of CDs to review as potential prayer bead music. I am happy to report that all the CDs they gave me were lovely, of not all were to my taste. Lilting piano melodies, driving (but not too driving) ethnic drums, soft strings and where there were vocals they were smooth and serene. I tried praying my beads with one of these CDs playing in the background until I went thru the whole stack. Not every one was to my taste. Buddha Chill was my least favorite because I don’t connect with electronic music. Sacred Blessings gave me a bit of a shock because the first track was an intro by Tony Robbins, the self-motivational guru, and I just kept wondering what he was doing on this CD while I was trying to pray. The rest, though, was lovely, and I give Robbins, who I believe is a Mormon, credit for including the songs and prayers of many faith traditions. My favorite CD was Celestial Mozart. For one thing, it had very few vocals, and those it did have did not distract me from my prayers because they were just syllables or in Latin, which I dont understand. I think it also helps that Markoe is a yoga teacher and intentionally arranged the music to be 28 to 60 beats per minute, which he identifies as “the best tempo range for deep relaxation.” Then there’s the fact that I just like Mozart – thank you Dr. Dietz and your music appreciation 101 I took at the University of Texas 25 years ago. Some things stick. Praying with music in the background may not be the thing for me. It is hard enough for me to focus my energy on what I am doing and not start thinking about my grocery list or my workload or how badly I want to eat a chocolate donut. I tended to get lost in the music. But maybe I just need some practice. I’d be interested in hearing back from those of you who do listen to music while you use prayer beads. Do you have any tips for those of us who find it a challenge? What are some of your favorite things to listen to? How do you stay focused on the prayer and not the music? Or, do you focus on the music and let that become a prayer? 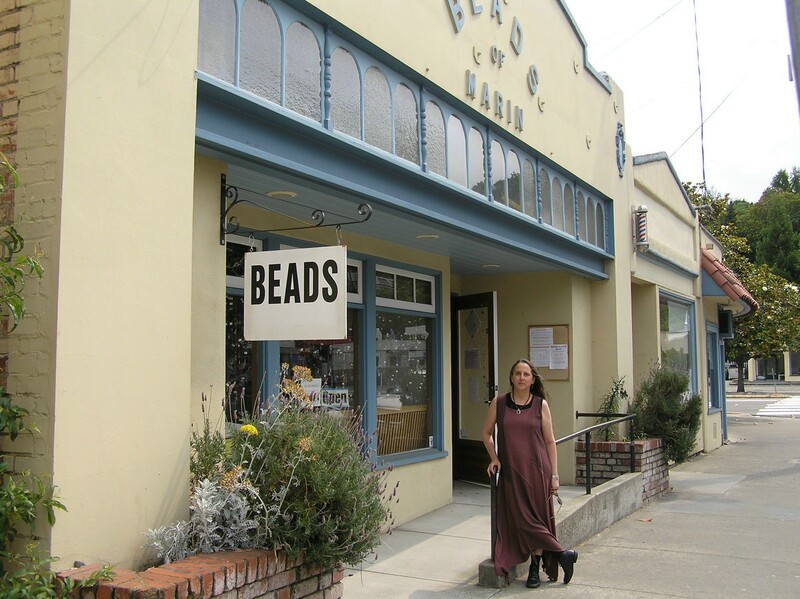 Step inside Mill Valley, Calif.’s Beads of Marin and it won’t take you long to notice that there is something spiritual going on here. Maybe it’s the lingering odor of sage, burnt that morning to dispel any lingering negative energy. Maybe it’s the dozens of Hindu and Buddhist malas that adorn the walls. 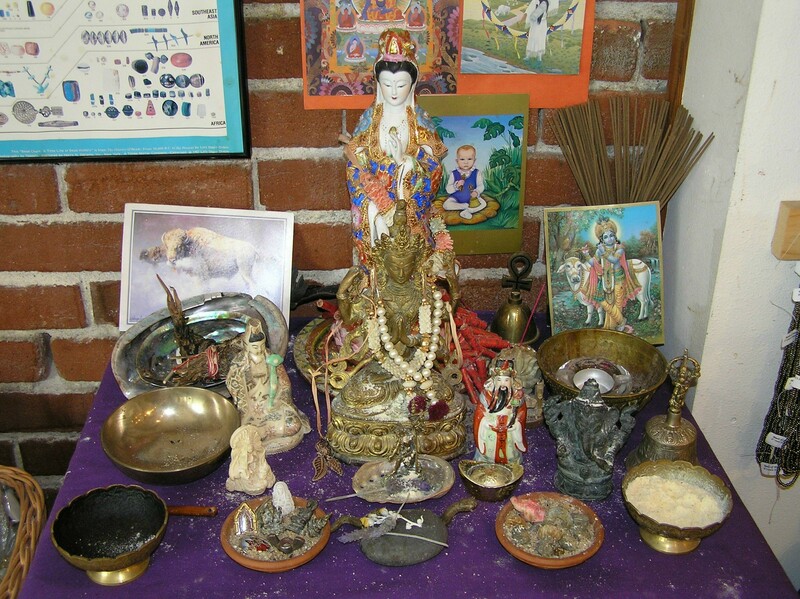 Or, maybe it’s the low altar placed along a wall of exposed brick that holds the signs and symbols sacred to many religious traditions – drawings of Hindu gods and goddesses, a photo of the Dalai Lama, a brass Egyptian ankh, a statue of the Buddha and a small figure of Kuan Yin. In fact, every morning before opening her store on Locust Street, owner Batel Libes takes a moment to light a Native American smudge stick and ring a Buddhist begging bowl. Only then does she open the door. “It cleanses the air, the energy,” Batel says. “It is something that makes me feel good, and at the end of the process it makes me feel ‘Ahhh! '” Here is a picture of the altar. But even if you never looked up at the walls or down at the altar, you’d soon suspect something spiritual was afoot. There are more religious and spiritually-oriented beads in Batel’s store than I have ever seen under one roof. 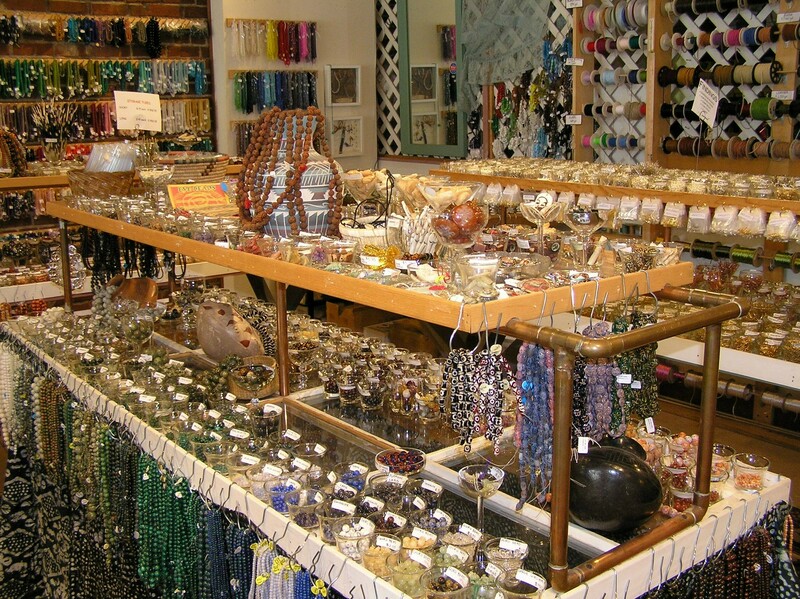 In fact, there is an entire table of beads and pendants Batel steers customers to when they want to make prayer beads, amulets, healing jewelry or other spiritually oriented things. Indeed, Batel describes herself to me as something of a spiritual hodgepodge. Her name is Hebrew for “daughter of God” and she tells me that she is Jewish, with influences from the both the Conservative and Renewal branches of Judaism, but then lets drop that she also incorporates some New Age and Buddhist practices on her spiritual journey. And for good measure, she rules no one else’s religious preferences out. “I believe we are all striving to reach the same place, but there are different ways to get there,” she tells me, a carnelian Buddha pendant framed in silver twinkling around her neck. For the next hour, I walk around Beads of Marin in a kind of prayer-bead feeding frenzy. 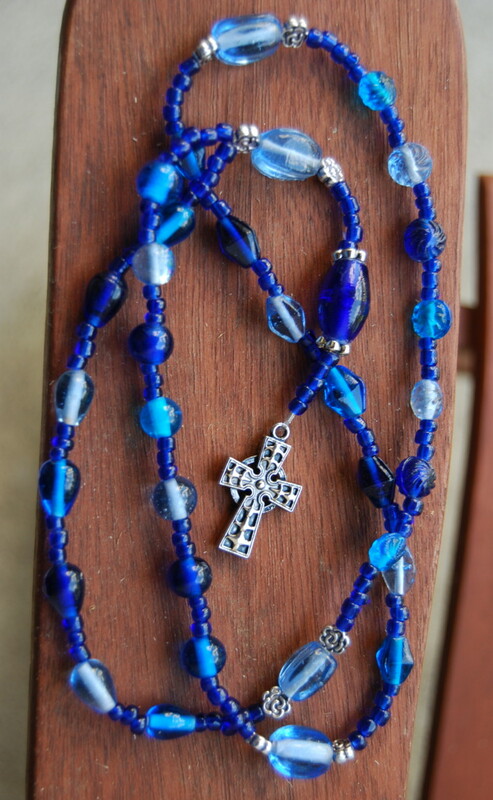 I try to take pictures of everything that I thought would make good Catholic rosaries, Anglican prayer beads, Buddhist and Hindu malas, Islamic subhah and other forms of prayer beads. Here is a shot of the prayer bead table . 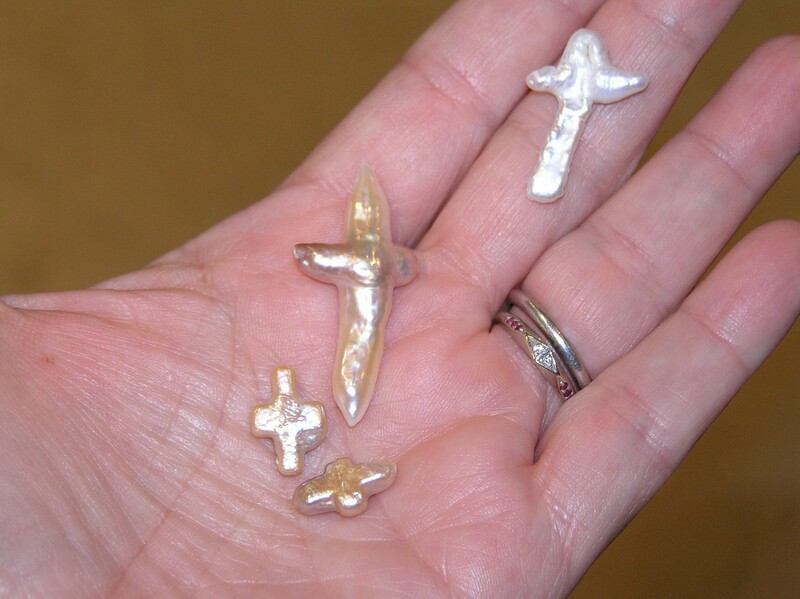 . .
And here’s a shot of some freshwater pearl crosses . 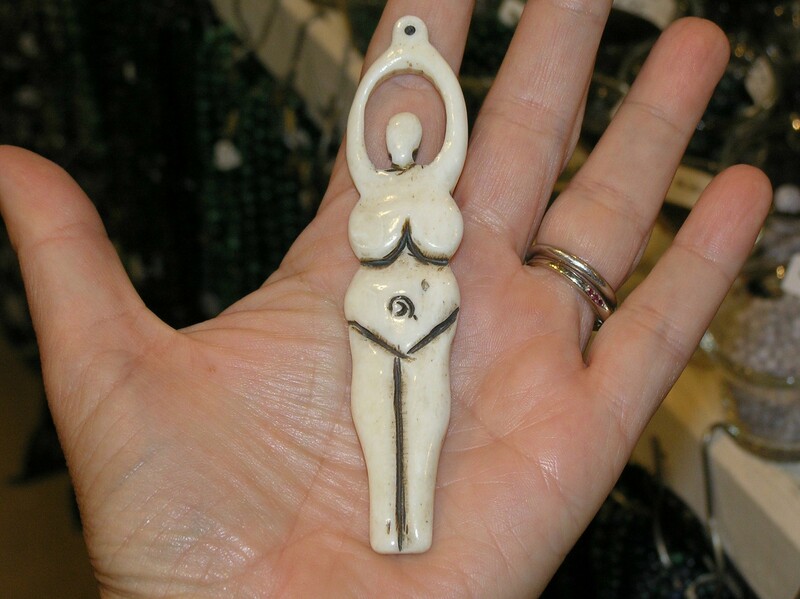 . .
And an ivory goddess bead. I sense a fertility theme! But there are also lots of more traditional prayer bead beads – rudraksha strands, crosses, stars, etc. 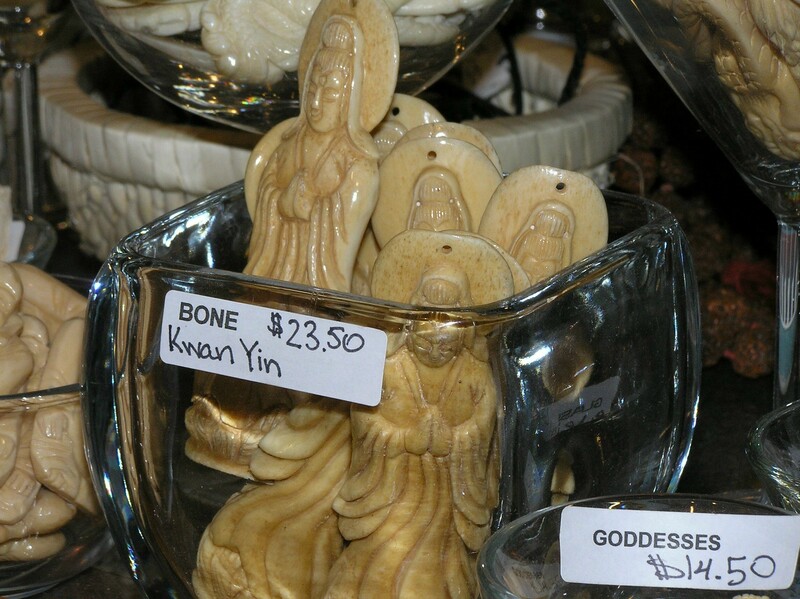 Part of Batel’s spiritual philosophy is to run an ecologically and economically responsible business, She routinely vets all of her vendors, making sure their ivory products pre-date the ivory ban, that their bone products come from animals not killed for the purpose of harvesting their bones and that their shell products are collected responsibly. She hopes customers will shun the “big box” craft and bead stores, both the bricks-and-mortar- type and the online kind, because they are not always so careful. She suggests bead consumers check the track records of any business before they throw their money at them, something she says can be accomplished by Googling “human rights” and “animal rights” and the name of the retail or wholesale venue. 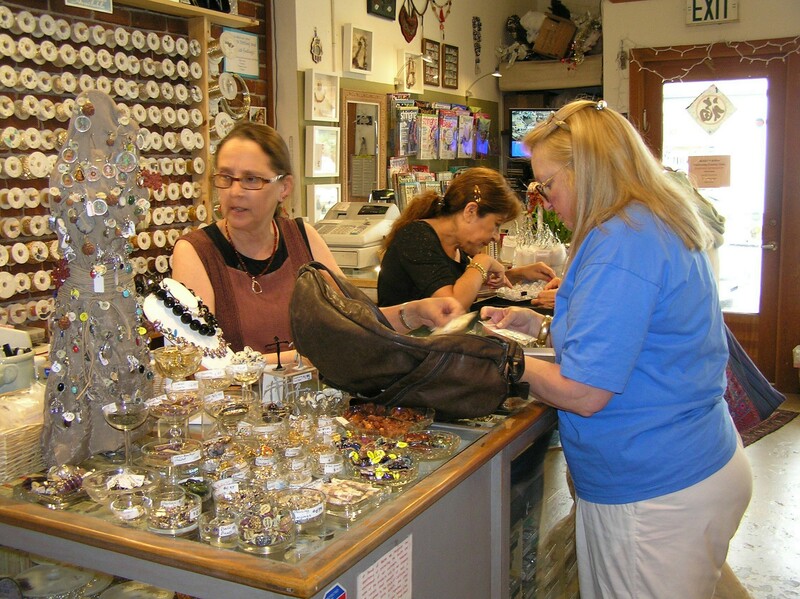 She also wants consumers to know that when they shop with a local, indie bead store they are giving back to their own community by supporting a local business owner and his or her employees. 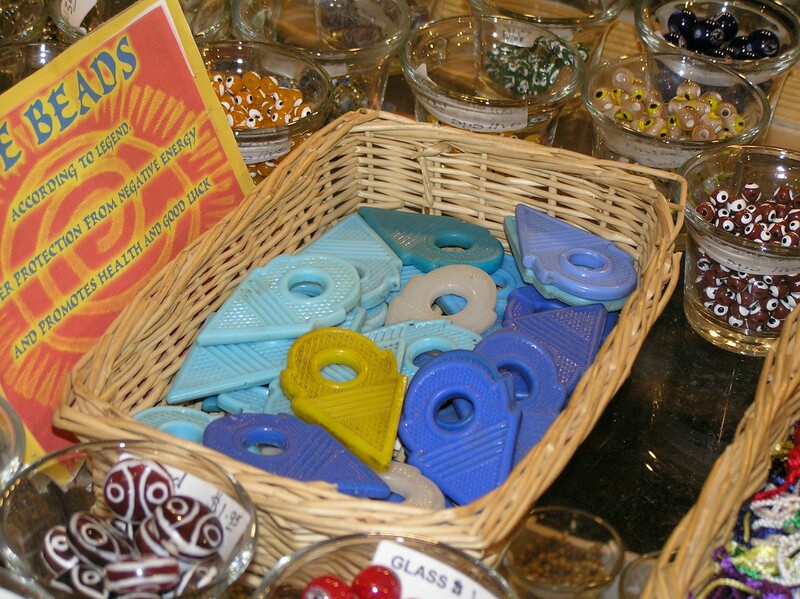 She is a member of the Local Bead Store Alliance, a trade association of 57 indie bead stores and their owners that are working to educate bead consumers about the benefits of shopping small and local. “It is a battle that bead store owners have everyday and a lot of us are going under,” she said. 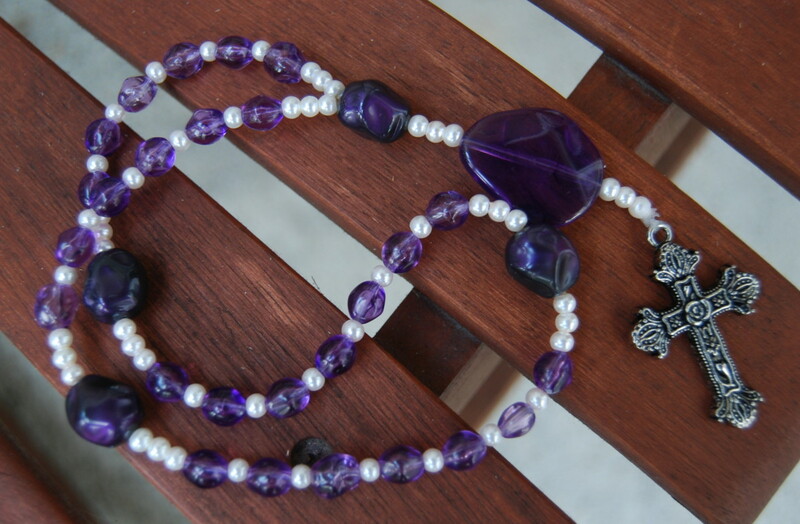 Beads of Marin does not have an online store, but Batel said she’d do her best to satisfy anyone who calls or emails about anything they see in this blogpost. I bought one of the round carnelian beads etched with a Buddha’s head and lotus, and one of the mermaids that is grasping a pearl. I also bought a quarter-sized carnelian disk that has a goat – my zodiac sign – etched into it. I hope to use all of these as terminal charms or invitatory beads and will post the finished products when I do!